Venereal disease research laboratory (VDRL) test is a nonspecific flocculation test which is used for the screening of syphilis. VDRL test is easy to perform and inexpensive, so it is commonly used in the screening of population for syphilis. Without some other evidence for the diagnosis of syphilis, a reactive nontreponemal test does not confirm Treponema pallidum infection. Acceptable CSF and serum specimen should not contain particulate matter that would interfere with reading test results. Non-treponemal antigen (Cardiolipin-Cholesterol-Lecithin) is used to detect the presence of “reagin antibodies” ( IgM and IgG antibodies to lipoidal material released from damaged host cells as well as to lipoprotein-like material, and possibly cardiolipin released from the treponemes) in patient’s serum. When the heat inactivated (to destroy complement) serum of patient is reacted with freshly prepared non-treponemal antigen, flocculation reaction (antigen and antibody complex are suspended) occurs. The flocculation can be observed by using microscope with 10x objective and 10x eye piece. 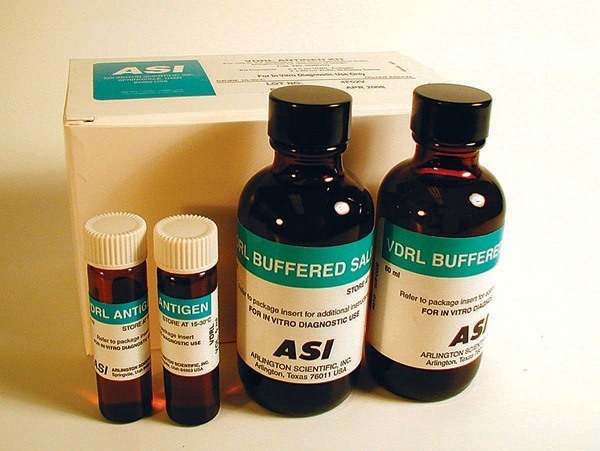 Reactive VDRL test serum can be quantitated to obtain the titre of “reagin antibodies” by using serial double dilution method. VDRL test is positive in most cases of primary syphilis and are almost always positive in secondary syphilis. The titer of reagin antibodies decreases with effective treatment, so VDRL test can be used to determine the treatment response of syphilis. VDRL may be reactive in persons from areas where yaws is endemic. As a rule, residual titers from these infections will be <1:8. Nontreponemal test titers of persons treated in latent or late stages of syphilis or who have become reinfected do not decrease as rapidly as do those from persons in the early stages of their first infection. In fact, these persons may remain “serofast,” retaining a low -level reactive titer for life. It can be seen because of prozone phenomenon (no flocculation due to antibody excess). In that case test serum has to be diluted further to obtain zone of equivalence (where maximum flocculation of Ag-Ab occurs). ASM: Veneral Disease Research Laboratory (VDRL) slide Test. In VDRL test why the pt’s serum is to b inactivated ?? may i know the steps taken to perform this test..